ONRAX, the industry leader of industrial strength ceiling storage platforms and ceiling storage innovation, has developed the Enduro-Deck™ decking system. The patented design of Enduro-Deck™ is a visually stunning, streamlined advancement in shelving technology. 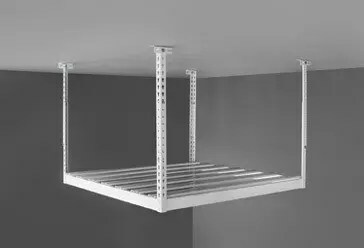 The exceptional strength of the ONRAX 14 gauge steel C-channel box frame, partnered with the Enduro-Deck™ system, allows ONRAX units the highest weight rating of any ceiling mounted storage unit on the market, up to 800lbs. Up to 4’ wide openings for storing long and bulky items. Drop up to 45″ from your ceiling. Up to 112 cubic feet of storage in a single SL4B unit!!!! 9 Shelf sizes and 2 height adjustment ranges. Custom sizes available for lofted and angled ceilings. Installation available in many areas at an additional charge.